Advanced manufacturing technologies (AMTs) combine novel manufacturing techniques and machines with the application of information technology, microelectronics and new organizational practices within the manufacturing sector. They include 'hard' technologies such as rapid prototyping, and 'soft' technologies such as scanned point cloud data manipulation. AMTs contribute significantly to medical and biomedical engineering. The number of applications is rapidly increasing, with many important new products now under development. "Advanced Manufacturing Technology for Medical Applications" outlines the state of the art in advanced manufacturing technology and points to the future development of this exciting field. Early chapters look at actual medical applications already employing AMT, and progress to how reverse engineering allows users to create system solutions to medical problems. The authors also investigate how hard and soft systems are used to create these solutions ready for building. Applications follow where models are created using a variety of different techniques to suit different medical problems. 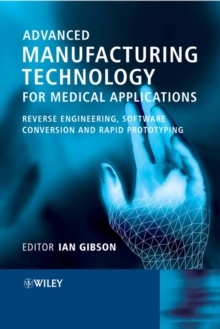 One of the first texts to be dedicated to the use of rapid prototyping, reverse engineering and associated software for medical applications, this title ties together the two distinct disciplines of engineering and medicine. It features contributions from experts who are recognised pioneers in the use of these technologies for medical applications. It includes work carried out in both a research and a commercial capacity, with representatives from 3 companies that are established as world leaders in the field - Medical Modelling, Materialise, & Anatomics. It covers a comprehensive range of medical applications, from dentistry and surgery to neurosurgery and prosthetic design. Medical practitioners interested in implementing new advanced methods will find "Advanced Manufacturing Technology for Medical Applications" invaluable as will engineers developing applications for the medical industry. Academics and researchers also now have a vital resource at their disposal.